America has had its fair share of divas, but one who takes the crown is Marilyn Monroe. She is most known for her long legs, blonde curly hair, and beautiful looks. The gig that kick-started Marilyn’s career was the 1953 movie, “Gentlemen Prefer Blondes”; from there she practically glided from role to role in all of Hollywood taking the industry by storm. Although it may sound like she had it easy, it took a lot to become miss Marilyn Monroe; easily argued to be America’s favorite bombshell beauty. Marilyn’s early lifestyle was unfortunate. If any star went through hell and back for a better life, it was Marilyn Monroe. Despite what some might believe, Marilyn’s birth name was actually Norma Jeane Mortenson (according to this website documenting her early life). She was born on June 1st, 1926 to Gladys Baker and lived most of her childhood in foster care. There was a point where Monroe was adopted by the couple, Grace and Doc Goddard, but due to influences from the great depression, they had to give her back. When she was a child, she was adopted by a couple who went by the name of the Boldenders. The Bolenders were highly religious making Marilyn go to church every Sunday and study a religious lifestyle. Through this couple, Marilyn promised to never swear, drink, or do anything considered sinful. Soon enough, Marilyn’s stepmother had a seizure and passed away leaving her to be taken care of by her original birth mother, Gladys, in 1933. Fortunately, Gladys’ house rules were much looser than that of the Bolender’s, in which Marilyn was allowed to hang out with friends and go to the movies. It was because of this Marilyn found her passion for the movies. Unfortunately, just as Marilyn’s life was looking up, her mother had a violent episode leading to Gladys being taken away from her daughter, leaving Marilyn orphaned again. In a 1962 interview of Marilyn recalling the moment, she said she remembered thinking, “Please, please don’t make me go inside. I’m not an orphan, my mother’s not dead. I’m not an orphan — it’s just that she’s sick in the hospital and can’t take care of me. Please don’t make me live in an orphans’ home.” Through these dramatic events, Marilyn was formed into a fragile, vulnerable, little girl. After three or so years of high school, Marilyn was forced into a relationship with a man named Jim. On his account, Jim said, “Our marriage was a good marriage . . . it’s seldom a man gets a bride like Marilyn . . . I wonder if she’s forgotten how much in love we really were,” showing how little Marilyn actually had to gain through the relationship. In 1943, while working on the military base, a man wanted pictures of women aiding the war efforts. It was this when she first caught the light of a camera lens, and right from there she was hooked. Her first taste of the limelight was on Yank magazine and from there Marilyn was working as a freelance model. Marilyn’s family had a lot of mental health issues, with grandparents who finished their lives in mental institutions and uncle that had schizophrenia. She also was shaped by those around her and mistreatment within the several foster care facilities. 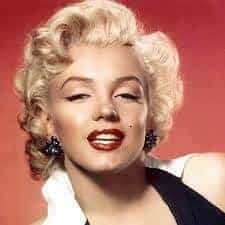 Why Marilyn Monroe Was the Most Influential Beauty Icon in American History (Part One- Early Life) by Mae is licensed under a Creative Commons Attribution-ShareAlike 4.0 International License. Are We Alone In the Universe? Continued.What Makes a Person Religious?